I promise I don’t always eat cupcakes and cookies all the time. I really do try and eat very healthy during the week and save my desserts for splurges on the weekend. In fact, I typically eat some variation of a smoothie for breakfast every morning. They’re filling and packed with super foods to get my day started. So with the New Year, I decided to switch it up a bit and eat my smoothies with a bowl rather than slurp it from the cup. Now, this may be a bit of a change because I will have to manage my time better in the morning. I guess eating your breakfast from a bowl no longer allows me to chug my shake in the car on the way to work. 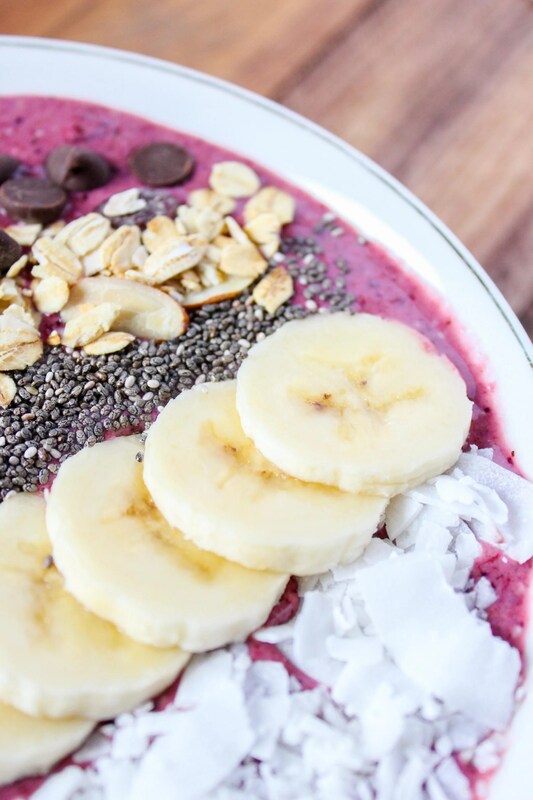 Time management and smoothie bowls. Both great New Year’s Resolutions. 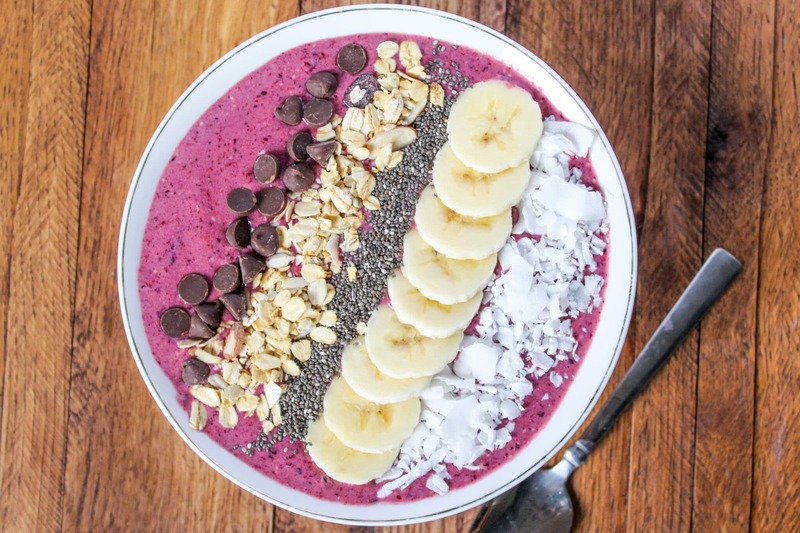 I was first introduced to smoothie bowls when I moved to Columbus and went to Alchemy for the first time. I ordered the Blueberry Acai Almond Bowl and fell in L-O-V-E. If you live in the Columbus area and haven’t ventured to this juice bar I highly recommend it. It’s operated by the wonderful and talented Hummusapien and she is a genius when it comes to smoothies bowls. Because another one of my resolutions is to save money, I decided to make a copy cat recipe of this bowl I fell in love with. And holy moly is this thing good. 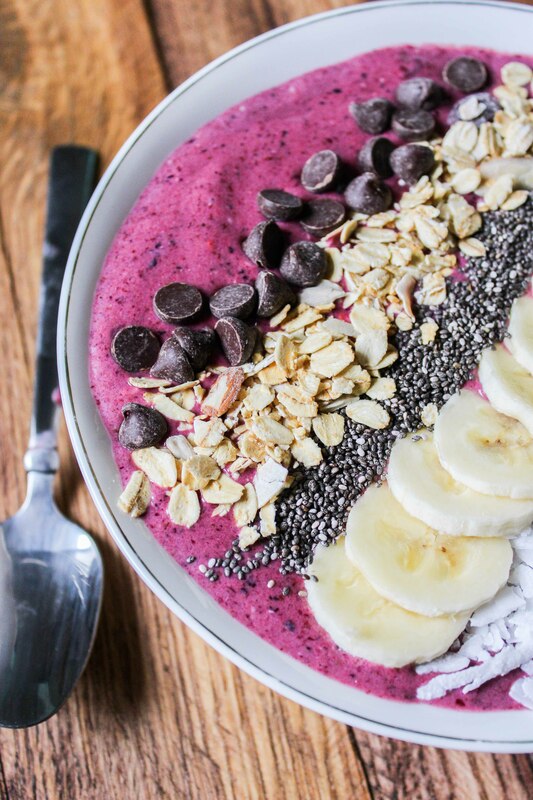 Make sure you use frozen berries and the correct amount of almond milk in this recipe or it will be more like a slurpable smoothie than one you need a spoon for. I’m going to start meal prepping my breakfasts by measuring out the ingredients (aside from almond milk) over the weekend and throwing them in freezer bags together. That way, I save time (see what I did there – time management) in the morning and can whip these up on command. Don’t feel the need to stick with the topping I used. I love the sweetness from the chocolate and the crunch from the muesli, but feel free to add anything you want, like extra berries or chopped nuts. If you feel so inclined you can even add some vanilla protein to this to fulfill some serious macros. I used Buff Bake Almond Butter from MixtNutrition in this recipe for a little added protein. So here’s to a wonderful 2016 full of healthy recipes and resolutions! Enjoy your breakfast! Add the berries, almond butter, half of the banana, coconut flakes and almond milk to the blender. Pulse until smooth. Mixture will be thick. 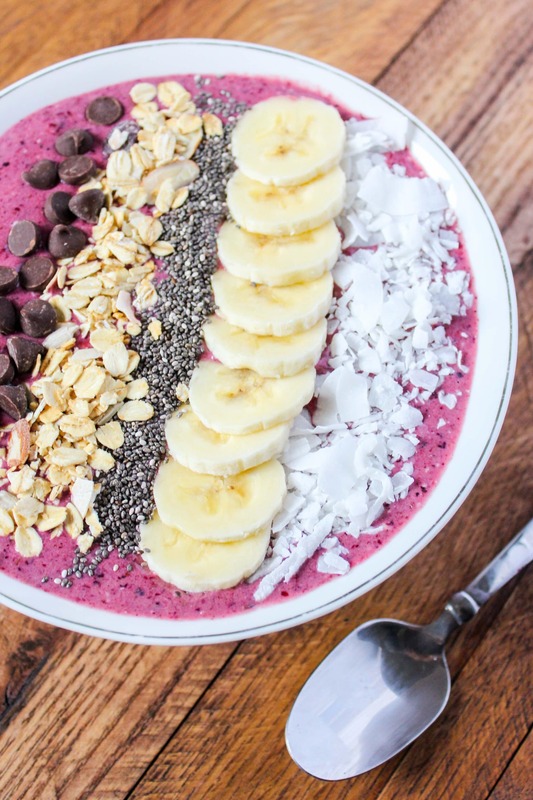 Spoon into large bowl and top with slices of other half of banana, dark chocolate chips, muesli, additional coconut and chia seeds.